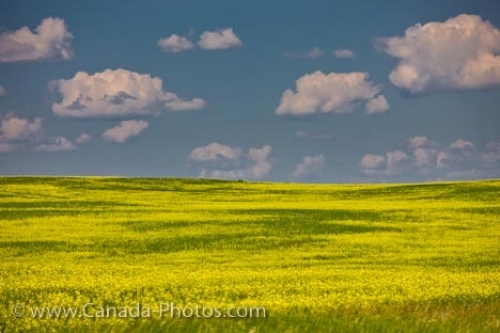 Across the landscape of the Qu'Appelle Valley in Saskatchewan, Canada, a canola field blossoming in bright yellow flowers during the summer is a picturesque sight. As far across the landscape as one can see, the field is aglow in yellow as the billowy, white clouds scatter themselves across the summer sky. Back in the 1970's, there were two cultivars of rapeseed, one being canola which was used to produce edible oil used in animal food, biodiesel and many people's kitchens across the world. Various other types of seeds have been tried since then which also grow well across the Qu'Appelle Valley in Saskatchewan, Canada. Approximately 3 to 4 million tonnes of canola seed is exported from Canada on a yearly basis and about 700,000 tones of canola oil. Picture of the soft summer clouds floating above the field of canola in the Qu'Appelle Valley in Saskatchewan, Canada. The Qu'Appelle Valley is an ideal location for growing canola and it is a very important part of the agricultural industry in Saskatchewan. Saskatchewan farmers have been growing canola for decades, but many still find each field to be a challenge as numerous factors are involved to produce the best crop.